Relate: “But you, O Bethlehem Ephrathah, are only a small village among all the people of Judah. Yet a ruler of Israel, whose origins are in the distant past, will come from you on my behalf.” With this famous prophesy the question, “where” was answered for a cadre of Persian magi. They had arrived unannounced and uninvited on Herod’s doorstep saying the stars declare a new king of the Jews has just been born. Herod, the current king of the Jews consults the religious leaders in Jerusalem and passes on from them to these magi that the king they seek has been born in Bethlehem. Then Herod waits. He was expecting those magi to return to Jerusalem before heading east. What he didn’t realize was that these men had now met Jesus and would no longer travel the same roads. They now deserved the common title we give them: “wise men”. Herod was infuriated by what he thought of as betrayal. Based on the information those magi had given him, the king sends soldiers to that small town of Bethlehem ordering that every boy aged two and under be killed. Jesus was safe. His father had been warned in a dream and, before those soldiers arrived, Joseph had taken his wife and son and headed off to Egypt. Here’s a question I end up asking every Christmas that can never be adequately answered: “What about those other fathers?” Bethlehem was a small village in those days so it wasn’t some huge massacre of thousands, but there were probably a dozen or two baby boys young enough to be killed. That means there was a good twenty or so households whose lives were irrevocably changed for the worse. There were a dozen or two fathers who weren’t warned in a dream and who were impotent to defend their own families against Herod’s wrath. React: I have been reading some history lately that describes horror and atrocities beyond imagination. I have read about calvary men who would place a stake in the ground and then grab children. The goal was to gallop by as fast as they could throwing that living child at the right moment so that it would be impaled on the stake. What these soldiers and criminals would do to those kids mothers and how they would die cannot here be repeated. It sickens me and even as I read about such events a hundred years old I get angry and frustrated that there is nothing I can do to protect or avenge these victims. How much worse would it have been for the few surviving fathers and uncles and neighbors who knew of these atrocities? How impotent and angry must the fathers in Bethlehem have felt as those soldiers killed their children. Soldiers throughout history being what they are, I doubt some form of game or sport was not done in that small town. It is easy for us to turn and blame God for such horrors. If Jesus had not been born those other children would not have died that day. If God had just done something then… you fill in the blank. I know that God does not create evil. I understand that even evil men still have the freedom to commit evil acts, but couldn’t He just snub out a few of the worst seeds like Talaat Pasha, Hitler, and Pol Pot? 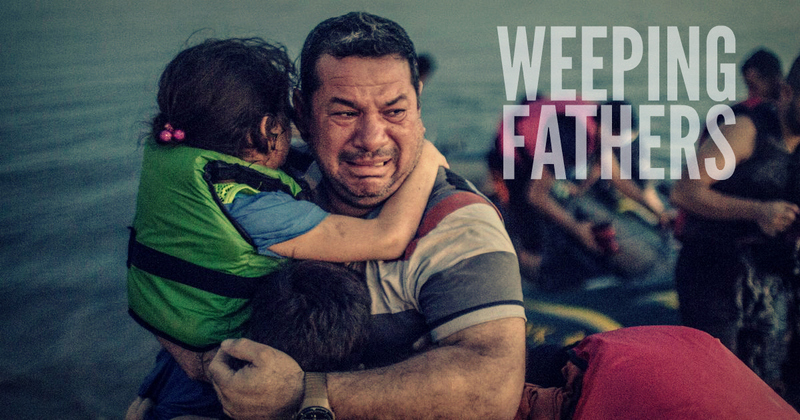 For weeping fathers, there is no adequate answers. This side of heaven, there never will be. God, although I do not have all of the answers, I do not doubt that You are good. Often the struggles I go through in my life are problems of my own making. Other times, we are the victims of evil people making evil decisions. I pray that You will not allow our hearts, my heart, to grow bitter in these moments. Help me to be a light of such brightness that such evil has no power to act. As long as I live in this world help me to following You in carrying Your light into the darkest places. Help me to be a good that helps make evil impotent. We have to understand a few things about the language of the bible and also that what Herod did was his choice. As humans we demand God lets us have free will and when it is exercised in a way we don’t like or agree with due to the consequence then we say God doesn’t care or isn’t fair. It is time to be honest as parents, mothers and fathers, sons and daughters the blame lies with people. God’s justice is that he provides the solution but we have free will and therefore the choice. So when God acts it is not out of a sense of retribution but eternal justice. I have far too vivid of an imagination. I cannot even hardly read of atrocities. I am a father. I turn off films or shows when I see things I cannot handle. If I can hurt for others like that, I can only wonder after our Heavenly Father. What must He feel when He sees the depth of evil in mankind? One thing which may help when we question or wish to stop the evil, is that God is at work. He hasn´t stopped since the very first baby was born. His care and His attention have not left us for an instant. And if He says the pain is worth bearing, we might do well to listen. Let´s continue to pray for all those who suffer. We will suffer along with them is some small part. But our Father will surely suffer the most! I feel the pain of what you say and what I hear in the news–which is why I try not to watch it. Praying for strength to endure until the end, no matter how much evil reigns in the hearts of many; I seek God for constant cleansing and pruning. Thanks for sharing! For me not watching the news doesn’t feel like an option. Injustice doesn’t disappear just because I am ignorant of it. I might need to stop reading it for a bit and grab my Bible instead, but once my perspective is better grounded I will come back to it. Sometimes, it looks like evil gets away with being evil. That is not really the case. Just because the judge postpones the court date does not mean that the crime will go unnoticed and unpunished. Someday, there is a reserved judgment for evil and it will all come to light in the court of God’s opinion. In the meantime, God does His share of protecting us from that which seeks to destroy us; EVIL! 2. Christ prayed for this – John 17:15 – I pray not that thou shouldest take them out of the world, but that thou shouldest keep them from the evil. 3. It is a product of the faithfulness of God – 2 Thessalonians 3:3 – But the Lord is faithful, who shall stablish you, and keep you from evil. 4. Christ prayed, “Deliver us from evil.” (Luke 11:4) He would not have prayed that way if we did not need His protection and deliverance from evil and its influence. When I read this story of the arrogant farmer I thank God for His mercy that He doesn’t settle accounts early. There’s always the possibility of grace and repentance. I’m glad for me and I am glad for my sake and for the sake of the rest of sinful mankind. I pray that we would offer that mercy and grace wherever we go so that none would have to face punishment when ‘account day’ arrives because we were not as loving as we might be. To many of his fellows, the proof of Jesus’s divinity was in healing. He always said something afterwards: “Your faith has healed you.” The ultimate lesson of the Resurrection is that power reaches even past death’s door. Love cannot judge, because if it did sin would claim grievance. All that it can do is heal, and the proof of sin is that it will reject healing to continue to do violence to itself. Wrongs such as Beejai describes have been, are, and will be healed. The process starts with carrying each other’s wounds in our hearts so that Christ can minister to them. When in that place, I tremble with tears because I feel so powerfully his agony that he cannot do more than that. It is a comfort to know that our Lord is in control even when seemingly bad things happen. He vindicates and avenges on His children’s behalf in His time and way. No wicked one is overlooked. HAPPY BIRTHDAY KWA BWANA YESU DEC 25TH.BWANA YESU AKO HOW OLD???????????????? ?ATA BLOW CANDLES NGAPI?????????? Thank you for this post. I cannot imagine what happened in those days. When I read of God telling the Israelites to kill every man, woman and child and spare nothing when they go out to war, I am scared of my own imagination of the gruesome scenes. I know that God knows best. He is a just God and loves us more than any parent (mother or father) can love a child. There is so much on this side of heaven that we do not know but we have to trust Him. On another note, recently I read on the internet about an atheist mother who was mad at Christians when they told her that her dead child was in heaven. She made it plain that there is no God and her child is not in any place called heaven. She holds fast to her unbelief. So sad but God each of us the free will.